Why was a successful New York banker not surprised to receive a woman's left ear in the morning mail? Why did a top Manhattan lawyer work only for one client, but never charge a fee? Why did a young woman with a bright career steal a priceless Van Gogh painting? Why was an Olympic gymnast paid a million dollars an assignment when she didn't have a bank account? Why was an honors graduate working as a temporary secretary after inheriting a fortune? Why was an English Countess ready to kill the banker, the lawyer, and the gymnast even if it meant spending the rest of her life in jail? Why was a Japanese steel magnate happy to hand over $50 million to a woman he had only met once? Why was a senior FBI agent trying to work out the connection between these eight apparently innocent individuals? 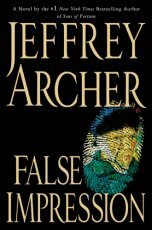 All these questions are answered in Jeffrey Archer's latest novel, False Impression, but not before a breathtaking journey of twists and turns that will take readers from New York to London to Bucharest and on to Tokyo, and finally to a sleepy English village, where the mystery of Van Gogh's last painting will finally be resolved. And only then will readers discover that Van Gogh's Self-Portrait with Bandaged Ear has a secret of its own that acts as the final twist in this unforgettable yarn.